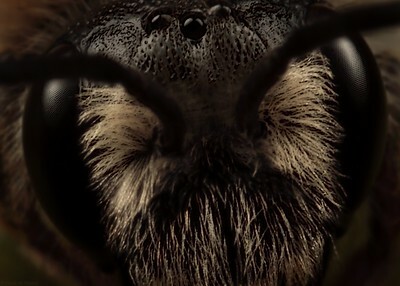 Frontal view mason bee, size around 10 mm, made with magnification factor 3 and f/14. 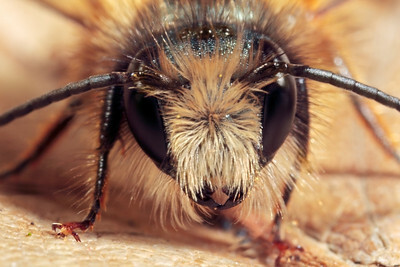 Portret mason bee, size 10-12 mm, made with magnification factor 4 and f/11. Mason bee, to obtain a larger area of sharpness focusstacking using 6 photos has been applied. Each photo has been made with magnification factor 2 and f/16. Bombus pascuorum, the common carder bee, is a species of bumblebee. Above his left eye, you can see a small mite. Mites, along with ticks, are small arthropods belonging to the subclass Acari (also known as Acarina) and the class Arachnida. The photo has been made with magnification factor 2 and f/16. 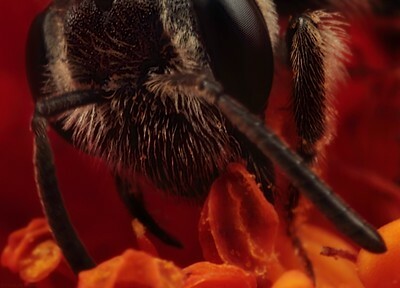 Compound eye red mason bee (osmia rufa), made with magnification factor 4 and f/14. 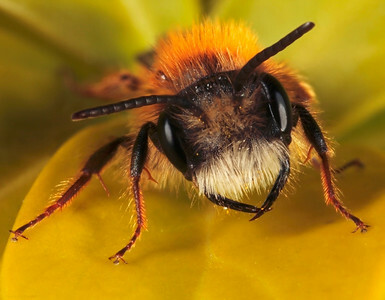 Osmia rufa is a species of solitary bee, also known as the red mason bee due to its habit of using mud to build small cavities within its nest. The species is most active during the spring and early summer although it can be seen as far as late June. Despite being classed as solitary, these bees are gregarious. The female is larger/broader than the male and has 2 large horns on the head.The female has a much smaller sting than honeybees or wasps.The male has no sting. The size is around 10 mm (source Wikipedia). 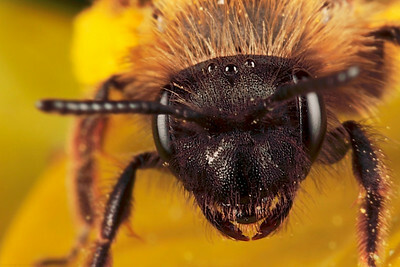 Portrait miner bee, made with magnification 4 and f/14 using a Canon 7D and a Canon MP-E 65mm/f2.8. Andrena (Miner bee) is the largest genus in the family Andrenidae, and is nearly worldwide in distribution, with the notable exceptions of Oceania and South America. 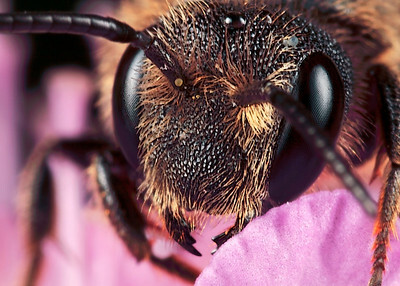 With over 1,300 species, it is one of the largest of all bee genera. Species are often brown to black with whitish abdominal hair bands, though other colors are possible, most commonly reddish, but also including metallic blue or green. Body length commonly ranges between 8 - 17 mm with males smaller and more slender than females (source Wikipedia). Portrait plasterer bee, made with magnification factor 6 and f/11. 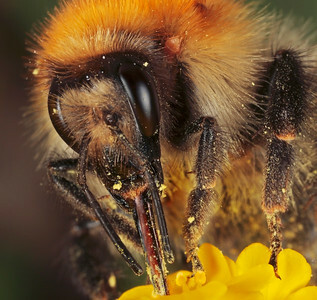 The genus Colletes (or plasterer bees, in Dutch "silk bees") is a very large group of ground-nesting bees within the bee family Colletidae, with over 450 species worldwide, primarily in the Northern Hemisphere, with nine species in The Netherlands and Flanders. These bees tend to be solitary, though sometimes nest close together in so-called aggregations. Species in the genus build cells in underground nests that are lined with a polyester secretion, earning them the nickname polyester bees. 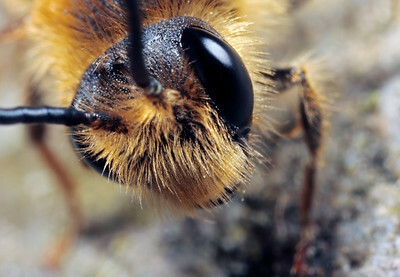 Most Colletes are found in July and August. 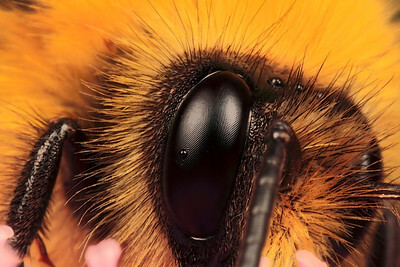 Right eye common carder-bee, picture has been made with magnification factor 4 and f/14 while the bee was running over a flower, using a Canon 7D and Canon macrolens MP-E 65mm/f2.8 Bombus pascuorum, the Common Carder-bee, is a species of bumblebee belonging to the family Apidae subfamily Apinae tribus Bombini. They are present in most of Europe in a wide variety of habitats such as meadows, pastures, waste ground, ditches and embankments, road, field margins, as well as gardens and parks in urban areas and forests and forest edges. 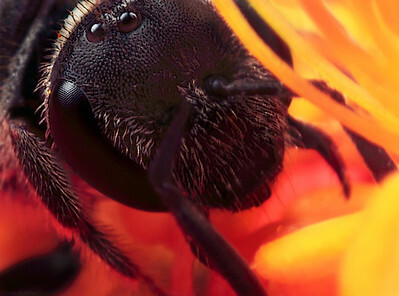 These bees reach a body length of 15–18 millimetres (Queen), 9–15 millimetres (worker) or 12-14 millimetres (drone). Their wingspan is 28 to 32 mm (Queen), 20 to 28 mm (worker) or 24 to 27 mm (drone) (source: Wikipedia). 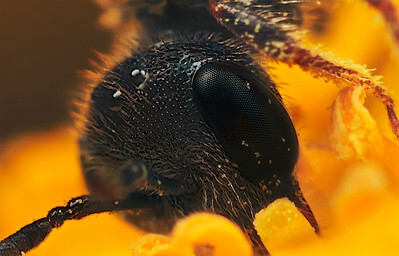 Portrait miner bee, made with magnification 8 and f/8 using a Canon 7D, a Canon MP-E 65mm/f2.8 and a 2x Canon Teleconverter. Andrena (Miner bee) is the largest genus in the family Andrenidae, and is nearly worldwide in distribution, with the notable exceptions of Oceania and South America. 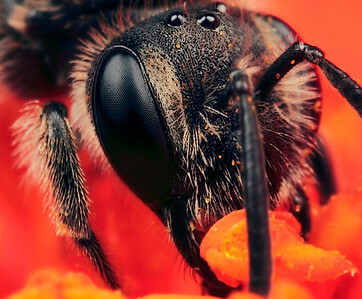 With over 1,300 species, it is one of the largest of all bee genera. Species are often brown to black with whitish abdominal hair bands, though other colors are possible, most commonly reddish, but also including metallic blue or green. Body length commonly ranges between 8 - 17 mm with males smaller and more slender than females. Portrait miner bee, made with magnification 6 and f/13 using a Canon 7D, a Canon MP-E 65mm/f2.8 and a 2x Canon Teleconverter. Andrena (Miner bee) is the largest genus in the family Andrenidae, and is nearly worldwide in distribution, with the notable exceptions of Oceania and South America. 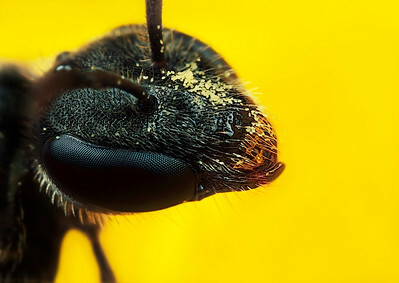 With over 1,300 species, it is one of the largest of all bee genera. Species are often brown to black with whitish abdominal hair bands, though other colors are possible, most commonly reddish, but also including metallic blue or green. Body length commonly ranges between 8 - 17 mm with males smaller and more slender than females. 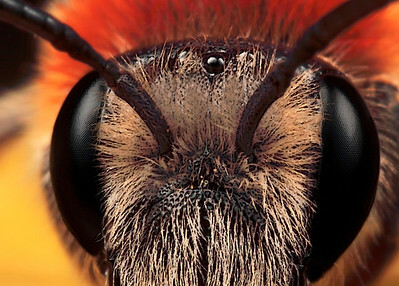 Detail head red mason bee (osmia rufa), made with magnification factor 6 and f/14. It is a single picture made in our garden, using a Canon 7D, a Canon MP-E 65 mm f/2.9 and a Canon 2x teleconverter. The bee was alive and kicking. 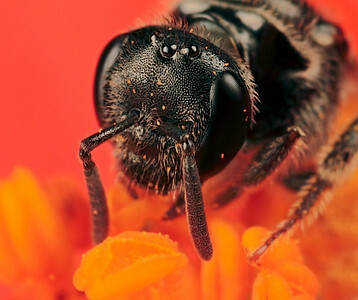 Osmia rufa is a species of solitary bee, also known as the red mason bee due to its habit of using mud to build small cavities within its nest. The species is most active during the spring and early summer although it can be seen as far as late June. Despite being classed as solitary, these bees are gregarious. 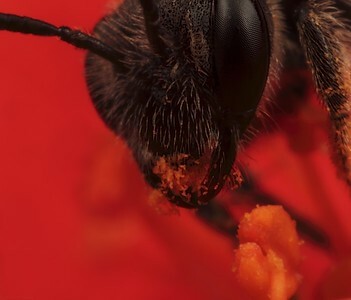 The female is larger/broader than the male and has 2 large horns on the head.The female has a much smaller sting than honeybees or wasps.The male has no sting. The size is around 10 mm (source Wikipedia). Portrait miner bee, made with magnification 8 and f/11 using a Canon 7D, a Canon MP-E 65mm/f2.8 and a 2x Canon Teleconverter. Andrena (Miner bee) is the largest genus in the family Andrenidae, and is nearly worldwide in distribution, with the notable exceptions of Oceania and South America. 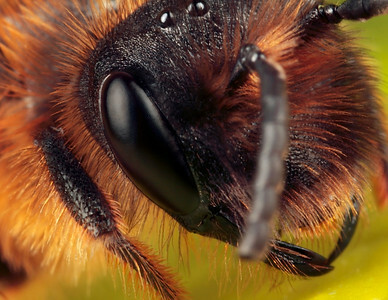 With over 1,300 species, it is one of the largest of all bee genera. Species are often brown to black with whitish abdominal hair bands, though other colors are possible, most commonly reddish, but also including metallic blue or green. Body length commonly ranges between 8 - 17 mm with males smaller and more slender than females.